SanDiegoVille: Chula Vista HarborFest Returns Saturday August 22 | This Year The Search For The Area's Best Taco Is On! Chula Vista HarborFest Returns Saturday August 22 | This Year The Search For The Area's Best Taco Is On! Chula Vista's annual HarborFest returns to Bayside Park at the Chula Vista Marina on Saturday, August 22, from 10am to 6pm, for a summer celebration of music, food, spirits and community. This free, family-friendly festival includes more entertainment than ever this year, including music and dancing on three stages, a taco and spirit competition, food trucks, a classic and exotic automobile showcase, art exhibitions, a Discovery Zone for the kids and so much more. We are raffling off 2 passes to the ticketed Tacos & Spirits Revolution portion of the event, so read on for details and be sure to enter! At HarborFest, San Diego's most popular hand-held food will be paired with spirit samples at the Tacos & Spirits Revolution, where local restaurants will compete for best of show while spirit purveyors offer tastes. Participating restaurants include Bernini's Bistro, Catalina Offshore Products, The Taco Stand, Harvey's Bar & Restaurant, Karinas Mexican Seafood, Mariscos German, Rubios and Savoie. Tickets to the Tacos & Spirits Revolution are $35 in advance and $40 on the day of the event and include samples from all participants. There is also a Chow Down option for $20 that just includes the tacos. Passes can be purchased online. There will also be some of San Diego's best food trucks in attendance ready to feed the masses at HarborFest's Food Truck Alley, as well as a Wine, Spirits and Craft Beer Tasting Garden. Prepare to get your groove on and dance, dance, dance in front of three stages - Latin Beats Stage, HarborFest Main Stage, & Chula Vista Community Stage! There will also be opportunities to tour historic ships, check out classic and exotic automobiles and stroll through the exhilarating art exhibition - all with breathtaking ocean views as a backdrop. Kids and adults alike will get the chance to discover the seaside ecosystem with educational exhibits from The Living Coast Discovery Center and Hubbs Seaworld Research Institute. The Discovery Zone will be filled with shows, interactive activities, arts and crafts, fishing off the pier and more. Cool off and splash in the water with some free kayaking and paddle board lessons. Thrill seekers will peek through their fingers over the daring, nail-biter, BMX spectacle show! The imagination will run wild at HarborFest with a world of bubbles with bubble wands. Pretend you are a bird learning to fly while attached to a bungee cord and practice your best pirate accent with Rad Hatter Pirates. 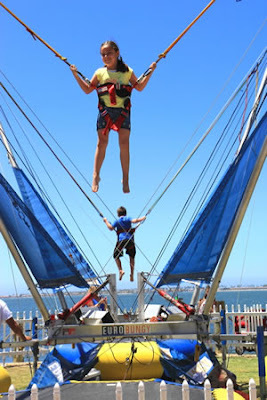 Try zip lining or some laser tag, then walk on water or get launched from a parachute rocket. There will be so much to do inside the in the Discovery Zone! 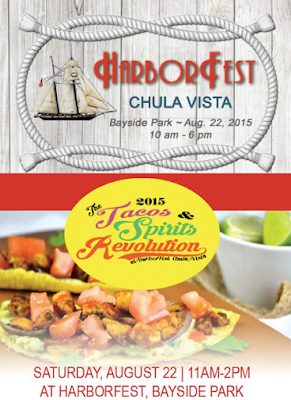 Don’t miss HarborFest 2015, brought to you by the City of Chula Vista and presented by the Port of San Diego. Through its Tidelands Activation Program, the Port of San Diego sponsors regional and community events and activities that support the Port's mission of providing economic vitality and community benefit through maritime industry, tourism, water and land recreation, environmental stewardship and public safety. For more information on Chula Vista Harborfest, visit cvharborfest.com.